While my company does use Dropbox from time to time, we are increasingly using BitTorrent Sync for more transfers. There are a few reasons, namely (1) local syncing for large media files without going to the internet – think new photos being copied from a smartphone to a computer, (2) disk cost since most Dropbox users only have a few GB of storage that fills up quickly, and (3) security of business records. 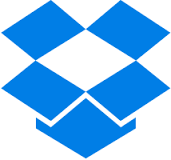 If you set up Dropbox correctly with enough space and turn on two factor authentication then it is perfectly secure for most purposes. Though there is something to be said for GnuPG encrypted files being dropped into a BitTorrent Sync shared folder that is peer-to-peer with the 3 people in your organization who have the need-to-know for that content. That is much more secure at the expense of a little easy of use. So if an individual or an organization wants to protect his or her or its rights and ensure that any and all legal process comes through his own front door with the ability to have his own lawyer go to bat to keep the government out, then sticking with alternatives that do not leave content stored unencrypted on a service such as Dropbox is a key consideration.